Authorities in military-ruled Myanmar, listed by Washington as among the world's worst human trafficking offenders, arrested a couple trying to smuggle four women to China, state media said Thursday. In a rare acknowledgement of the problem, the Myanmar-language Mirror paper said the two [traffickers] were held as they tried to bring four women to board a train in the commercial hub Yangon to the border town of Muse. From there they would have been smuggled into China to work as maids, the newspaper quoted police as saying, and identified the couple. The government admits women from Myanmar have been lured to China with the promise of good jobs but were instead sold and forced to marry older men. 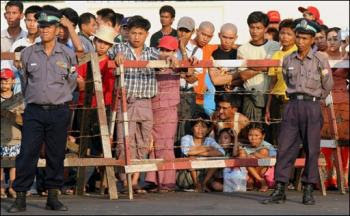 Myanmar made human trafficking illegal in September 2005, but in an annual report last year the United States accused the government of complicity in the smuggling of people to Bangladesh, China, Malaysia and Thailand. Among the reasons were sexual exploitation, domestic service and forced labour. Myanmar sentenced 33 human traffickers to life in prison in February last year, while in 2006, Chinese and Myanmar police arrested 64 people for human trafficking. United Nations Global Initiative to Fight Human Trafficking website www.ungift.org aims to be an extension of UN GIFT activities worldwide. We would like it to evolve into a vibrant online community where people exchange views, showcase their work, talk about their experiences and strengthen the fight against human trafficking. With your help we can make it a valuable resource and a tool to take this fight forward. The organized crime of human trafficking needs a fitting organized response.